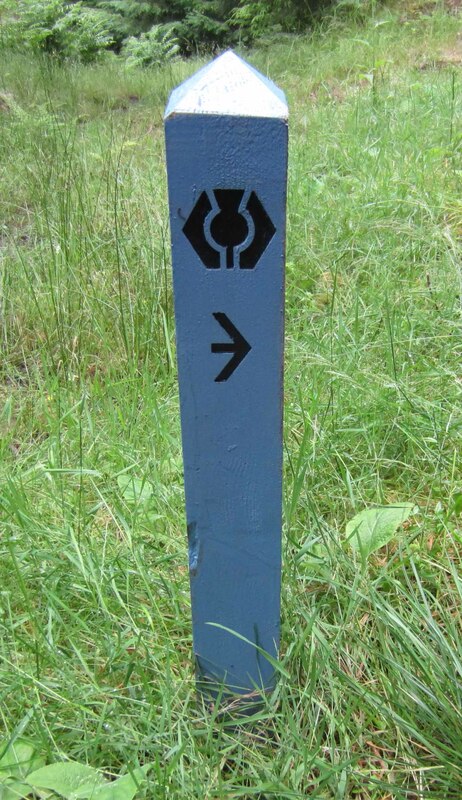 A typical way marker on the Great Glen Way near Inverness. A few years ago Emmy and I were expelled from a beautiful country where we had been doing quite a lot of walking. It was a nice, peaceful country with wonderful scenery. We didn’t want to leave but we were told our visa had expired and could not be renewed. We were frog-marched to the border and forced across it into the neighbouring state. We’ve now put the frontier some distance behind us as we walk into this new and unfamiliar territory. It’s called The Seventies. It lies between The Sixties where we used to live, and a remote, rarely-visited state – a bit like Bhutan – called The Eighties. We have noticed that the countryside seems to be getting more and more Bhutan-like. There is a range of very high mountains in front of us and we can’t see what’s beyond it. So we have been trying to find an easy way through. OK, OK… that’s enough of this allegorical stuff. This post is about the challenges of long distance walking when you’re old, so let’s get down to business. Stamina When you’re old the capacity to persevere over long distances goes into decline. A decade ago I could knock over twenty-five or thirty kilometres a day and feel no ill effects. Now I find it a challenge to walk twenty kilometres a day. I can still do it, but I usually feel quite tired at the end of the day. Strength Muscles start to weaken in old age so you can’t lift a heavy backpack so easily or lever yourself up steep inclines. Worse, muscles hold the bones together, so as they weaken you are more likely to dislocate a joint or suffer a slipped disc in the back. Fragility The bones, joints and muscles become more fragile. It is easier to injure yourself – to break a bone, to pull a muscle, to sprain your ankle or feel stress-pain in the knees. And if this happens it takes longer to recover, for tissue to repair itself or a broken bone to knit. Less speedy Increasingly you lose the capacity to run or suddenly move fast. So when you have to cross a road (for example) you can’t rely on speed to avoid cars. You can’t run to reach shelter if it starts to rain. You can’t ford a stream by hopping nimbly from stone to stone. This segment of “path” was more like a rocky stream. 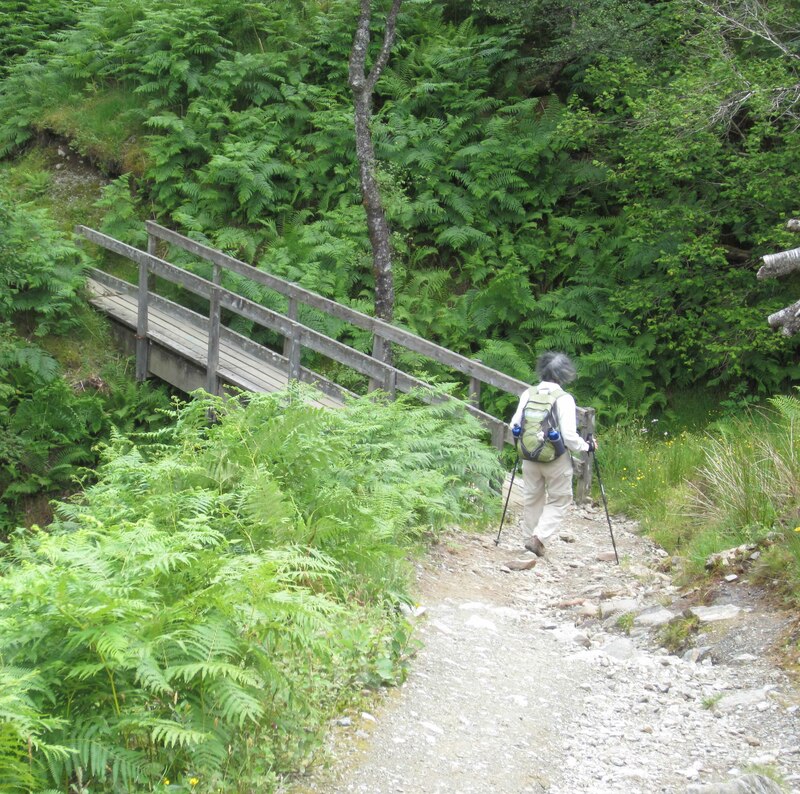 Between Ardlui and Crianlarich on the West Highland Way, 30 July, 2015..
Balance Balance becomes less secure as you age. This can be a problem when you are crossing stiles or moving over rough ground or when you are going down a steep incline or when the path is slippery. And the problem of poor balance can be exacerbated if your eyesight is also in decline because good balance seems to depend on collaboration between your inner ear and your eye. Hydration and urination Old people are less able to deal with extremes of temperature, especially heat. We get dehydrated and over-heated quite easily and this slows down the workings of the brain as well as the body. When you’re on your own in a remote place you don’t want to get mentally confused. You will also probably need to urinate more often (the ageing bladder seems to have less carrying capacity). Long distance walking is low-impact exercise that you can do well into extreme old age. To be honest though, I don’t do it primarily for health reasons. The health benefits of walking are a welcome spin-off, of course, but they come second to the inner walk you undertake whenever you pull on your boots. I walk mainly because I enjoy the constantly shifting views, the peering around corners, the isolation and silence, the glimpses of wildlife, the sudden surprising sparks of thought, the guilt-free munching on chocolate. I’m pretty much in the same mould as Gu Yanwu and Patrick Leigh Fermor (both of whom have made an appearance in this blog) but needless to say I’m a bumbling Wile E. Coyote compared to these road runners. In truth, the frailties I’ve laundry-listed above don’t amount to much. They can easily be combatted by keeping an eye on three key watchwords: preparation, caution and concentration. Preparation Don’t make the mistake of starting a long walk too casually. You need to know as exactly as possible what you’re letting yourself in for. I’ve failed to do this a couple of times and got myself into trouble. Afterwards I berated myself for being geriatrically unprofessional (a certain amount of professionalism is required to be a successful old person). For an example of what can happen if your preparation is careless have a look at my post of August 8, 2011: https://walktenthousandmiles.net/2011/08/08/i-misjudge-the-cumbria-way-and-pay-a-painful-price/. Most important of all, make sure you’ve built up your fitness gradually but as fully as possible before you start your walk. 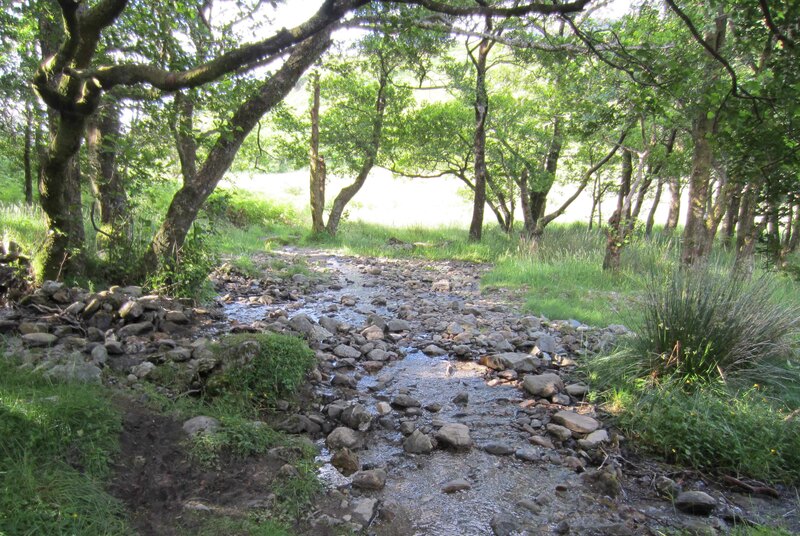 Ideally you should do a couple of dry runs over similar terrain and distances to the walk you are planning. As far as distance is concerned it is sensible to cut your coat to fit the cloth available. But being “sensible” is a bit boring. Just between you and me it is also good to stretch yourself a little – maybe stretch yourself a lot. The grimace of doing so is quickly transformed into a smile when you successfully push yourself beyond what you thought was “sensibly” possible. Caution Be ultra-careful. There is nothing worse than pulling a muscle when you are putting your socks on, or leaving your maps behind in the grass after a trackside toilet break (I’ve done both). As you age you can’t recover so easily or quickly from mistakes and accidents. So err on the side of caution in all you do. And remember: slow is good. But having said that, don’t get fixated on risk-free walking. Old people need to take risks as much as callow, shallow youths do. Taking risks is risky, but it is also very good for your mental resilience. A word of warning though… you should be selective about the risks you take. In particular, as far as possible your risk-taking should not inconvenience younger people, the public at large, or “the authorities”. Although some people admire risk-taking in old people, most people have a double standard. They don’t mind young people taking risks (that’s “normal”) but they may get annoyed when risks are taken by “some old fool” they think should be doing crossword puzzles with a rug over their knees in front of a heater. So try to ensure that you, and you alone, bear the consequences of your risk-taking. That way you can avoid being patronised when things go wrong. This smug-looking elderly walker has just scaled the heights above Invermoriston on the Great Glen Way. Concentration Surprisingly, walking demands pretty intense concentration over many hours. You can’t just set your feet in motion, then daydream or rubberneck. It is mentally exhausting to walk a long distance. There are two main reasons for this. First, to avoid getting lost you need to concentrate hard on navigation. Most of the tracks I have walked have been well way-marked, but there are tricks and traps in even the clearest track. Sometimes path markers get overgrown, on some the paint may have faded or flaked, elsewhere signs, markers or landmarks may simply have disappeared. Even the path itself may disappear. And maps are not always clear either. It is often hard to match the coarse scale of a map with the immediate detail you are facing. Maps also get out of date quite quickly. GPS devices and compasses are very helpful but they have to be consulted. They can’t stay in your pocket. So even with this technology unrelenting vigilance and frequent stopping are important. It looks benign, but the gravelly surface makes this descent potentially dangerous. 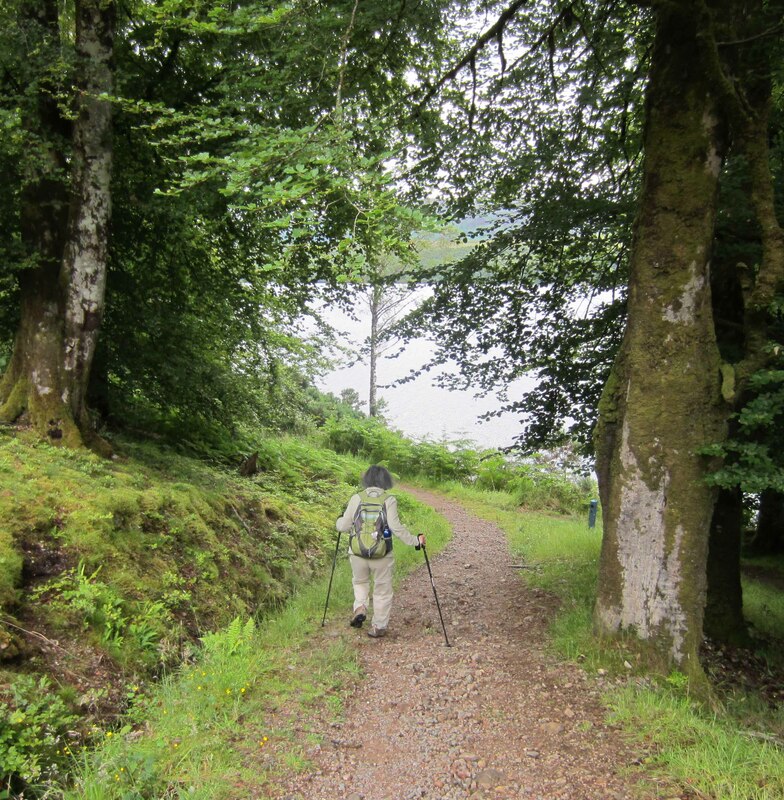 North shore of Loch Lochy, Great Glen Way, 8 August, 2015. Second, tracks can be rough – stony, slippery, twisty, narrow, muddy. A lapse in concentration can bring a stumble or the potential disaster of a fall. Don’t forget, if you are carrying a backpack you will be top-heavy. So it may be more difficult to keep your balance, and a fall can very easily be a heavy crash. And tracks can be very up and down. For elderly walkers a steep descent is an obstacle to be feared. It threatens severe punishment for even a split-second lapse of concentration. But again there is good news. Concentration is an excellent tonic for the ageing brain. The more you have to concentrate the better you are able to concentrate. For old walkers a strong mind is as essential as a strong body. The ageing body is quite resilient and adaptable, but when it falters the ageing mind – stiffened by hours of concentration – can step in and push it on. Now, as I puff and stagger towards the end of this post, I want to recommend two items of gear that walkers of any age, but elderly walkers in particular, should have. First, walking poles. Two of them. Walking poles have two main functions that are crucially important for old people. Most importantly, they help a lot with steadiness and balance especially on steep descents, but also, they take a bit of pressure off your legs by giving you a lot of extra leverage through the arms. So don’t even look out the front door without a pair of them. 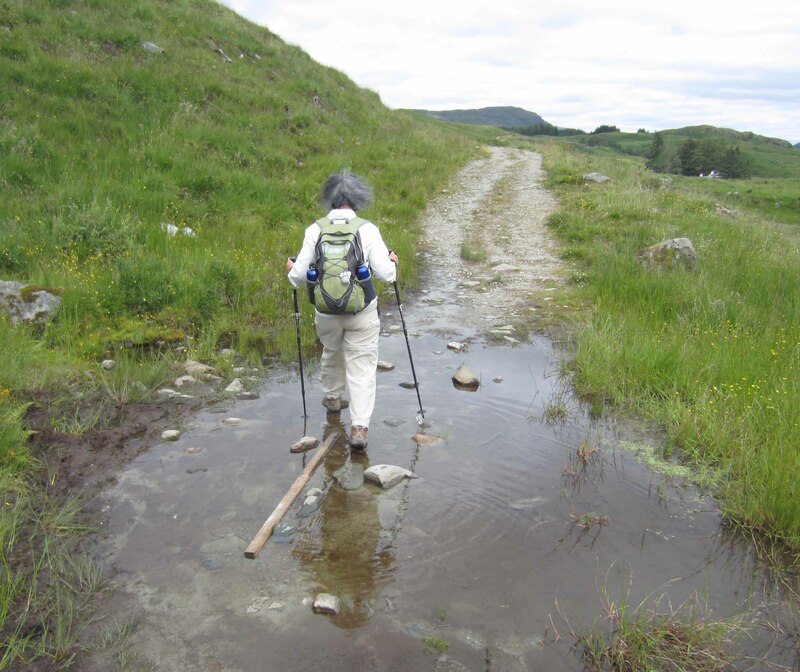 Walking poles are essential to help get you through muddy patches. Near Crianlarich on the West Highland Way, 30 July, 2015. Not beautiful, but an effective solution to chafing and blisters. 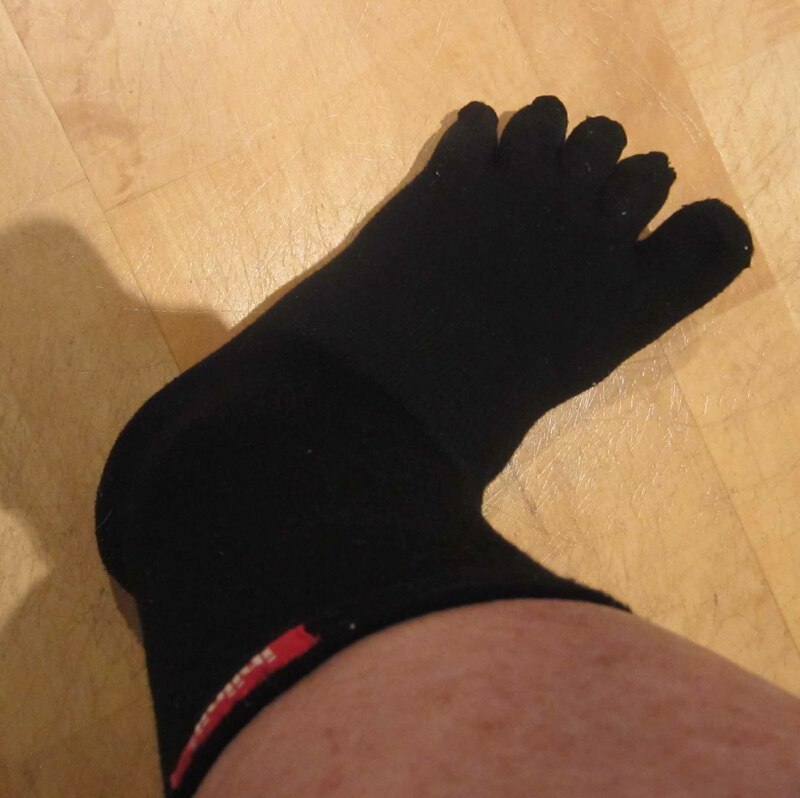 Injinji toe socks. Second, buy some toe-socks. These are specially made socks with a little pocket for each toe, like the fingers on a pair of gloves. I used to suffer from blisters caused by chafing between toes. My toe socks stopped this problem instantly and permanently. The brand I use is Injinji. Before putting them on I powder my toes and feet very thoroughly with fine, sweat-absorbing talc. I also powder the outside of the toe socks and put on a second pair of socks, ordinary ones, usually thin white cotton socks. So I have two layers of socks. There is a bit of slippage between them that helps prevent blisters. Since adopting this strategy five years ago I have walked many hundreds of kilometres without a single blister, or any other kind of foot problem. Ah… the end of this post has come into sight. It lasted longer than I expected but I took it slowly and I got there in the end. Time to rehydrate with a pint of calorie-rich cider. You have to be careful going down steep descents like this one. The pebbly surface is treacherous. On the West Highland Way between Ardlui and Crianlarich, 30 July, 2015. 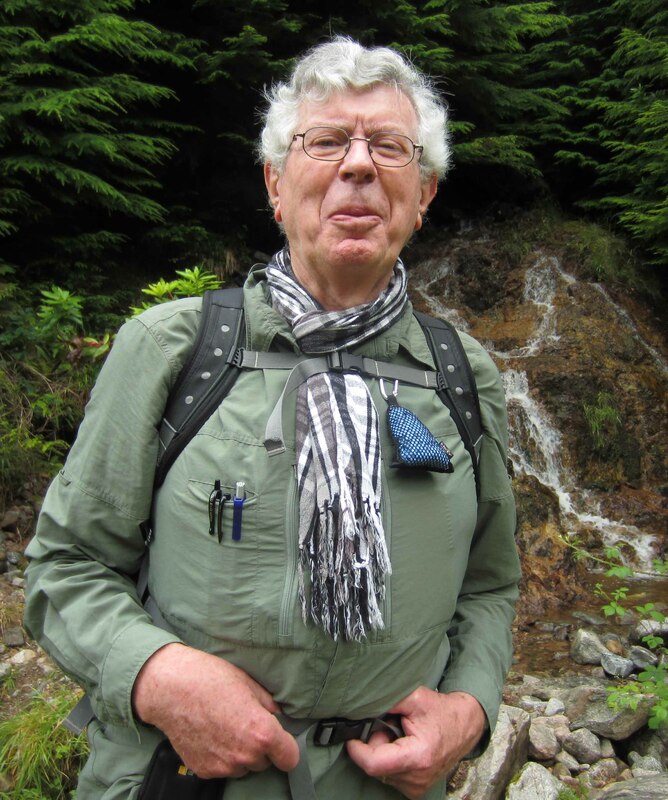 This entry was posted in Reflections on walking and tagged long distance walking, old age by George Quinn. Bookmark the permalink. Thanks, George! If we ever get out onto a walk I shall de-archive this post and take all your excellent advice. You are very welcome Lois. Behind this “excellent advice” there is a history of painful trial and error! Hopefully you won’t make the same mistakes I did. Greetings from London.